Your holiday destination is a famous sea resort on the coast, the largest in the Vendee, on the Atlantic coast, where it is bustling with activities. It is an ideal destination for family holidays or holidays with friends, in the vicinity of beautiful secluded beaches and a long and rugged coastline. You will find many beaches at the resort: the main beach; facing south, the bay of Sables d'Olonne, a fine sand beach stretched over 3 km, very suitable for relaxation and swimming, wonderfully sheltered, well cared for and guarded. It is equipped with tents, beach clubs for children and adults and you will find water sports facilities here. The beach of Tanchet; many kilometers of pristine, rugged, rocky coastline. The residence is located in the middle of a pine forest, 700 meters from the beach and 1.5 km from the city center. You will find a building with three or four floors, a swimming pool built in a quiet and luxurious environment, shops, casino and thalasso therapy you will find 500 meters away. This studio has an area of ​​23 m2 and is suitable for m2. It consists of a living room, kitchen corner, bathroom, separate toilet. The living room has a trundle bed and a bunk bed. The kitchen has a fridge, microwave and grill, electric hob and dishwasher. In most apartments you will find a separate toilet. For an additional fee you can book a TV, baby package and final cleaning, which can be paid on arrival. Pets are allowed for a fee, provided they are notified during the reservation and on a leash and in possession of a valid vaccination certificate. You can use the following facilities as a guest: heated outdoor swimming pool open from mid-May to mid-September, laundry for a fee, WiFi hotspot for a fee, billiards for a fee, bike rental, free outdoor parking, parking space in the garage for a fee. There is a vending machine with soft drinks and sweets, operated with coins. The nearest shops, casino and thalassotherapy are 500 meters away. Bed linen is provided. For an additional fee you can book a TV, baby kit with bed, bath and booster seat and final cleaning. You must pay a deposit and a city tax on arrival. You will receive the deposit on the day of departure after the inventory or by post. You must leave the accommodation spotlessly clean, if that is not the case, you will only receive a part of the deposit back. Pets are allowed for an additional fee, provided they have a valid vaccination certificate and tattoo, the dogs must be kept on a lead in the residence. 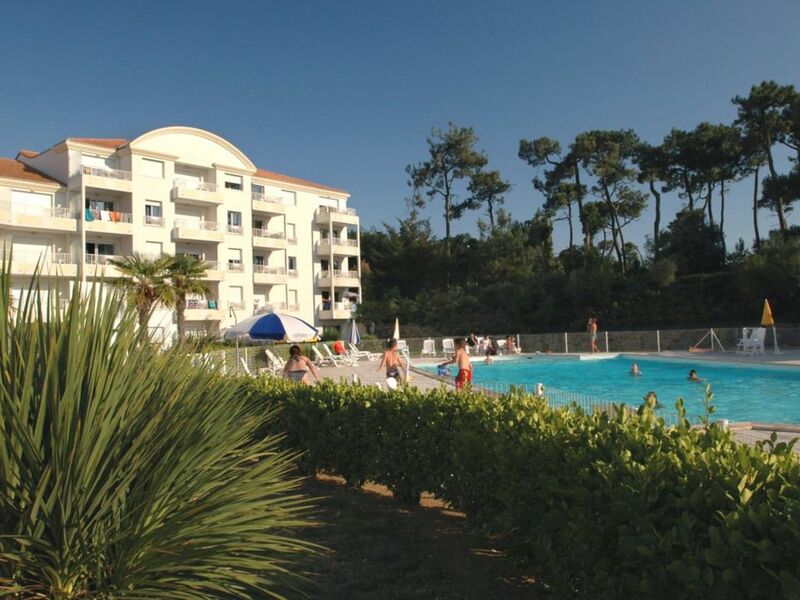 Other attractions of the residence are: Le Casino des Pins, a leisure center near the residence, with special prices for the guests of Odalys holiday makers for funny golf, tennis, the bar, restaurant, Le Bien Etre and Mieux, the thalassotherapy center of the Sables d 'Olonne, facing the sea, hidden in a pine forest in a quiet and sunny area, 10% discount on the Remise and Forme cure and all treatments of Espace Forme for Odalys holiday makers. There are three units of these accommodations that are very comfortable accessible for the disabled, ask for availability during the reservation. Les Sables d'Olonne is the city of Vendée Globe, the capital of sailing. What can you do, see and visit here; Peat with forests and marshes, salt marshes, thalassotherapy, casino, bowling, karting, the zoo, the covered market, the surroundings of Chaume and Ile Penotte, the bird sanctuary, the harbors, Sea-shell museum, motorcycle museum, St. Croix monastery with contemporary art, museum with popular traditions.